When talking about sustainability the general public often thinks about environmental sustainability only. However, sustainability researchers and activists have a much broader definition: sustainability is defined as meeting the needs of the present without compromising the ability of future generations to meet their needs. While this is a simple and therefore appealing definition, the devil is in the details. For instance it is rather hard to know the needs of future generations — as we often struggle to understand even our own needs. What is quite clear by now is that such an approach, aiming at a good livelihood for all, has to consider both: natural systems as well as human systems and think them together. Today we still struggle to meet even the basic needs of many people of our present generations. While on the other side those who are already well off, live lifestyles that more often than not are depleting and destroying nature and natural systems at an unpresented speed, possibly corrupting everyone’s ability to meet their needs in the long and increasingly also on the short run. Sustainability problems like the climate and biodiversity crisis, economic inequality, poverty pose great challenges to humanity. 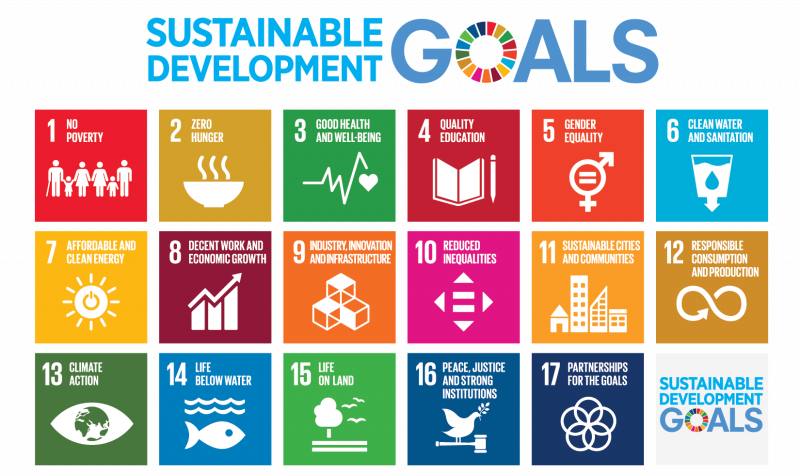 To help tackle this global challenges the United Nations have defined the 17 Sustainable Development Goals (SDGs) with the objective to produce a set of universal goals that meet the urgent environmental, political and economic challenges facing our world. These goals are broadly defined, very often interdependent, and include 169 sub-targets. The SDGs cover environmental, social and economic development issues including poverty, hunger, health, education, global warming, gender equality, water, sanitation, energy, urbanization, nature conservation protection environment and social justice. The SDGs provide a common and agreed framework to address our most pressing sustainability issues. To reach these goals it will not only be necessary to work together across sectors, industries, countries and communities but also to find new ways of how to organize our societies and their economies. For this transformation towards sustainability Blockchain based applications could be an important enabling technology. Our project therefore will assess Blockchains potential to contribute to the SDGs. Blockchain based applications provides many opportunities to help us create a more sustainable world. They can provide (1) more transparency about individual and collective action, as well as reliable provenance within global supply chains (2) strengthen accountability loops and reduce bureaucracy and power asymmetries enabling new types of applications (3) incentivize environmental friendly behaviour with purpose driven tokens. But isn’t Blockchain un-sustainable? Widespread media coverage about mining aspects of Bitcoin and other Blockchains, very often focus on the energy inefficiency of this technology. While this technology is in fact energy intense, most media coverage (a) fails to compare the CO2 footprint of Bitcoin transactions with the CO2 footprint of state of the art non-blockchain solutions like bank transactions, and also (b) forget to mention that the crypto community is fact working on solutions to this problem, all of which I will address and cover in a separate blog post published later this fall. Right now I would like to focus on how this new technologies can help us “program a sustainable world”. The lack of transparency along the supply global supply chains create challenges regarding fraud, pollution, human rights abuses and other inefficiencies. Sustainable behaviour of individuals and companies is therefore currently hard to track and not well rewarded. In this context Blockchain has the potential to provide an unprecedented levels of transparency, with a shared, decentralized database where immutable and encrypted copies of the information stored on every computer (node) in the network. This enables otherwise trust-less parties, such as individuals and firms that do not know each other, to engage in near frictionless peer-to-peer transactions. Blockchains can therefore serve as a transparent bookkeeping machine that everyone can inspect (public and permissionless blockchains) or a limited group of people can inspect (private and federated blockchains, also referred to as DLT). This type of transparency has applications (1) along the supply chain of good and services, (2) in institutional settings, for less corruption and more accountability. Supply chains represent a complex networks of distant, separate entities that exchange goods, payments, and data across a dynamic, continuously evolving landscape. Their underlying architecture of has many similarities to how Blockchains are set up. Blockchain based solutions can therefore help us trace the provenance of goods and services along the supply chain, to unambiguously identify a product’s input materials, including the material’s quantity, quality and origin. The Blockchain protocol, as a decentralized network with distributed and transparent data structures, allows a disparate group of network actors to exchange data relatively seamlessly from anywhere in the world, replacing traditional centralized data structures (client server architecture, multiple document copies, data inconsistencies, or in many cases still paper copies) with a distributed ledger, in almost real time, so that auditing can be automated. Lack of transparency, as well as costs imposed by some unscrupulous intermediaries, prevents many end users from knowing who earns what along the supply chain of goods and services they consume or what the working conditions along the supply chain are. Blockchain base solutions have the potential to provide us with greater accountability and responsibility around human rights, eg. monitoring factory working conditions for modern day slavery, child labour, employees being exposed to toxins, or revealing if farmers receive fair prices for the value they created. Such solutions would however include a combination of Blockchain, AI and IoT, to provide full transparency over what happens along the global supply chain. Blockchain based machine consensus and smart contracts have the potential to reduce transaction costs and bureaucracy in many industries and across jurisdictional borders, introducing many new use cases in (1) governance, government and impact assessment especially across jurisdictional boundaries; (2) inclusion of the underbanked and undocumented of the world; (3) disintermediation: making some clearing institutions or governmental institutions obsolete thereby reducing power asymmetries. Blockchain based applications can provide solutions that contribute to (a) CO2 emission reduction, (b) lean government, (c) impact assessment and governance tool. CO2 emission reduction could be achieved as a result of blockchain based e-government solutions, potentially leapfrogging state of the art e-government solutions. This would reduce the necessity of physical commute to a government office (ie: to pick up a new driver’s licence, apply for tax number, register a car, etc.) and reduce fossil fuel emission. Blockchain are especially useful for cross jurisdictional governance where cost effective, transparent and auditing measures can be implemented into the protocol, making monitoring and enforcement of all sustainability goals easier. All our daily transaction leave a carbon footprint — whether it is obvious, such as filling up our cars with petrol or booking a long-haul flight, or subtle, like when we buy a coffee or a new pair of shoes, or increase our cloud storage plan. Unfortunately, until now, monitoring and reducing our impact on the planet has been difficult, mostly because access to data is limited. Combining Blockchain with AI and IOT will allow us to draw better data for impact assessment and evaluation and make collective sustainability behaviour across groups and geographic boundaries more transparent. In combination with AI (software oracles) and IoT (hardware oracles) the fulfillment monitoring of sustainable action could be verified in an objective and decentralized manner. Blockchain based solutions could, for example, provide more transparency regarding the actions of governments (countries, cities or regions) do to reduce overall emissions. Recording these actions on blockchain would make international treaties much more stringent , at lower transaction costs than today. Impact assessment would be easier to track leading to quicker results and feedback loops. Possible Solutions: Ocean Protocol, IXO. In a world where carbon emissions and credits can be tracked transparently and reliably at low costs, at the point of sale, retailers will be able to sell a product and take into account the carbon impact it creates at the same time. Governments will be able to measure, track and trade emissions transparently, consumers will be able to understand the environmental impact of the products they are buying — both positive and negative — and will be able to mitigate this in an instant, with millions of micro-transactions scaling up to make a huge collective impact. Reduce cost of bureaucracy through more efficient e-government tools saving taxpayers money. Depending on the type of estimation, more that one to two billion people worldwide are unable to prove their identity to the satisfaction of authorities and other organizations — often excluding them from property ownership, free movement, and social protection as a result. Additionally, A Lack of identity prevents credits, loans and thus prevents entrepreneurship. Millions of refugees trying to relocate around the world can’t be identified, a disproportionate amount of them being women and girls, who struggle to obtain IDs, often the result of barriers related to: freedom of travel, distance, financial costs, time constraints, illiteracy, lack of information and awareness, and lack of support from family members. Blockchain can allow for complementary decentralized and self sovereign identity solutions. While the number of unbanked individuals is decreasing, there are still 2 billion people on the planet without access to traditional banking services. These underbanked people have to rely on alternative financial services like payday loans, pawnbrokers, and loan sharks, that are often highly unregulated and can be exploitative and even downright criminal. Blockchain with it’s peer-to-peer nature removes the need for verification from costly intermediaries such as banks or other institutions. The World Food Programm (WFP) is trialling blockchain as a means of making cash transfers to the underbanked more efficient, transparent and secure, through vouchers or pre-paid debit cards, allow people to purchase their own food locally and are an effective way to empower them to make their own purchasing decisions to relieve hunger. Cash transfers are an increasingly important means of providing assistance for example to refugee camps. The WFP therefore aims to reduce payment costs associated with cash transfers, better protect beneficiary data, control financial risks, and set up assistance operations more rapidly in the wake of emergencies. Blockchain-based applications are also seen as a development vehicle which can help to empower people directly and mitigate power and information asymmetries, replacing certain aspects of clearing institutions or governmental institutions with smart contracts. One example could be applied in the renewable energy sector: Once on the grid, renewable electricity is indistinguishable from electricity from conventional sources. Existing mechanisms, such as renewables certificates that are traded between parties, needlessly take up time, energy and resources. These certificates could be replaced by a system that monitors renewable electricity generated onsite, feeding data into a blockchain. This would result in the automatic creation and distribution of certificates. Furthermore, the prevalence of smart meters and other IoT devices, could enable P2P energy trading, where owners of distributed grids efficiently and legitimately sell excess power to anyone within an open market. Blockchains, smart contracts and token inventive mechanisms have a great potential to facilitate a more sustainable world. However, change does not happen by itself. Technology is just a tool, not a silver bullet. It will not magically protect forests, reduce CO2 emission or restore ocean health. Applied correctly, it can facilitate smart choices by producers and consumers, governments and corporations. However, the technology is still in its early stages, with many technological, legal and network effect challenges ahead. Furthermore, token engineering (the design of token governance rules) is a new domain. Most tokens today do not incentivise behaviour, but represent assets. There is still little experience, expertise and tools for token design, we are in a state of trial and error, with very few best practices we can learn from. Tokenized initiatives need to be translated into everyday applicability for the improvement of local livelihoods. Incentive-structures need to take a range of different agents into account. Blockchain-based solutions also need to take ground-truths into account, including existing physical and social infrastructure. Thanks Martin Wildenberg, Tatjana Novakovic, Georg Eder, and Evgeniia Filippova for their input.